In this photo provided by Colin O'Brady, of Portland., Ore., he poses for a photo while traveling across Antarctica on Wednesday, Dec. 26, 2018. 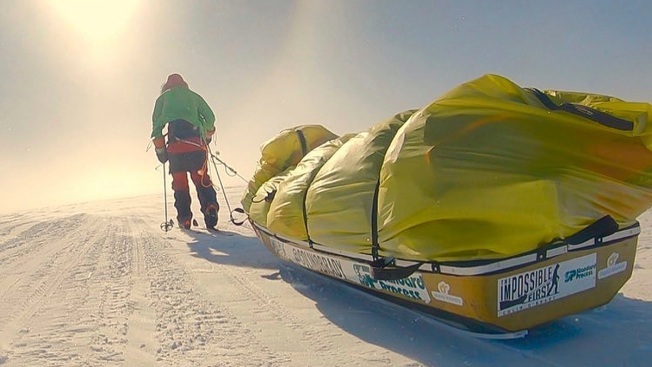 He has become the first person to traverse Antarctica alone without any assistance. O'Brady finished the 932-mile (1,500-kilometer) journey across the continent in 54 days, lugging his supplies on a sled as he skied in bone-chilling temperatures. The 33-year-old O'Brady documented his nearly entirely uphill journey — which he called The Impossible First — on his Instagram page. He wrote Wednesday that he covered the last roughly 80 miles (129 kilometers) in one big, impromptu final push to the finish line that took well over an entire day.